Konra, the glorious victor of Dragon Con's 2015 Miss Star Trek Universe Pageant, is a Klingon opera singer. You heard me right...a Klingon opera singer! Minus forehead ridges and horns, the magnificent Hannah Hoyt is a North Carolina-based composer who just so happens to also posses a phenomenal operatic voice. She's performed opera professionally, but I think this might be a Dragon Con-only kind of performance...but if she takes it on the road, I'm first in the ticket line! Hannah Hoyt's rendition of an aria from Mozart's "The Magic Flute" (you'll know it when you hear it) was splendid...and in Klingon! You don't hear that every day. As usual, all of the contestants (11 this year) were fantastic! But sitting there, hearing Konra perform, I knew immediately that she must win! The audience's reaction was thunderous AND we were treated to an encore immediately after she was crowned! 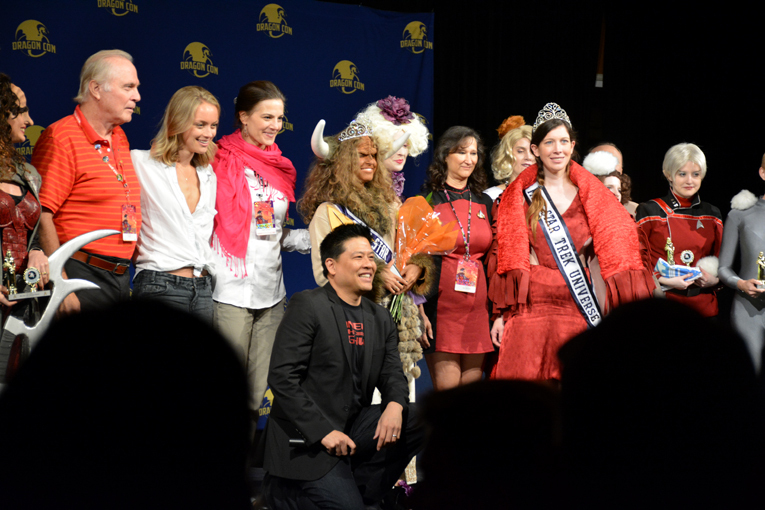 This was the 6th Annual Miss Star Trek Universe Pageant, part of Dragon Con's Trek Track. We've had the great fortune of having Garrett Wang (Harry Kim in Star Trek: Voyager, my favorite series in the franchise) as the Trek Track Director. I think they should promote him to Trek Track Admiral...the man is amazing! This is a 2.5 hour event that includes an audience participation "Kahless Says" game (It's like the Simon Says game you played as a kid, but in this version there are no survivors); three segments of the pageant (introductions/costume, talent, and Q&A); and while the judges are deliberating, Garrett divides the audience into eight segments assigning each a sound, phrase or song. After a couple of practice runs he conducts one of the more unique performances I've ever heard...doors swooshing, "Kaaaaahn! ", "Shut up, Wesley!" and the TOS fight song were a few of the elements this year. It's great audience-participation fun! This year's panel of judges was again awesome. 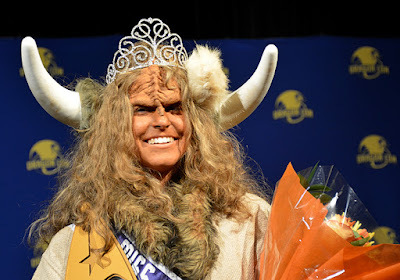 It included Emily Cook, Miss Georgia 2009; Terry Farrell (Dax on Star Trek: Deep Space Nine); Gil Gerard (Buck Rogers in the 25th Century); Jamie Higgins (2014 Miss Star Trek Universe, as Mother Horta); and other prestigious personalities. We're grateful for their time and the fun they bring to the pageant.